What’s better than one can of 9mm rounds? 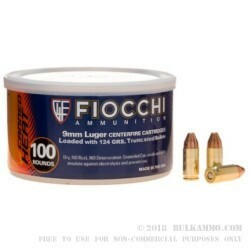 10 cans of 124 grain full metal jacket 9mm rounds from renowned ammo manufacturer Fiocchi! These 9mm rounds are part of Fiocchi’s Canned Heat line, which combines all the things you love about ammo with all the things you love about canned soup, namely that it’s in a can. Since each can is sealed against the elements, there’s no concerns when storing ammunition long term as a survival supply in the event of a breakdown of social order. Additionally, 1,000 rounds of these 124 grain 9mm rounds is the perfect amount to set aside in the event of an emergency. If shooting is your goal instead of storage, then these Canned Heat 9mm rounds are a great choice. The small can takes up the same amount of space as a 50 round box of ammo would, but doubles the capacity, so your range trips can last longer and you can keep your training levels up. These rounds are loaded on new manufactured brass, with 124 grain truncated cone profile bullets. The truncated cone is the same profile as most modern hollowpoint rounds, another advantages for shooters interested in training for self defense. Q: "Canned Heat" What is with this title? Does this ammo have better shelf life becaus eit is stored in the can? Is the can air tight? A: Canned Heat ammo is designed for long term storage. The can is airtight. Q: If I have a automatic pistol that has 'feed issues' do you think that using this round will help solve this problem? A: While this 9mm ammunition is loaded to exacting standards by a high quality manufacturer, with a projectile design that will feed reliably in almost every semi-automatic pistol in existence, it is impossible to know whether or not it will function in a pistol that is known to be unreliable. It would be recommended to contact a gunsmith or the manufacturer of the pistol regarding this problem. Q: Should I always pick brass instead of steel. Will the latter cause fouling due to oxidation? A: Steel cases are normally coated with a polymer or lacquer that helps protect the case. Neither one will cause fouling because of oxidation. However, brass cases do have a higher level of corrosion resistance than steel cases. Q: This looks like an interesting round. How many fps is this round rated for from the factory? 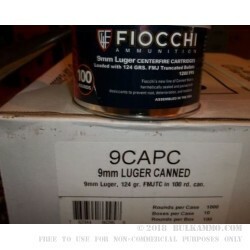 A: This Fiocchi Canned Heat 9mm ammunition has a factory velocity of 1200fps.